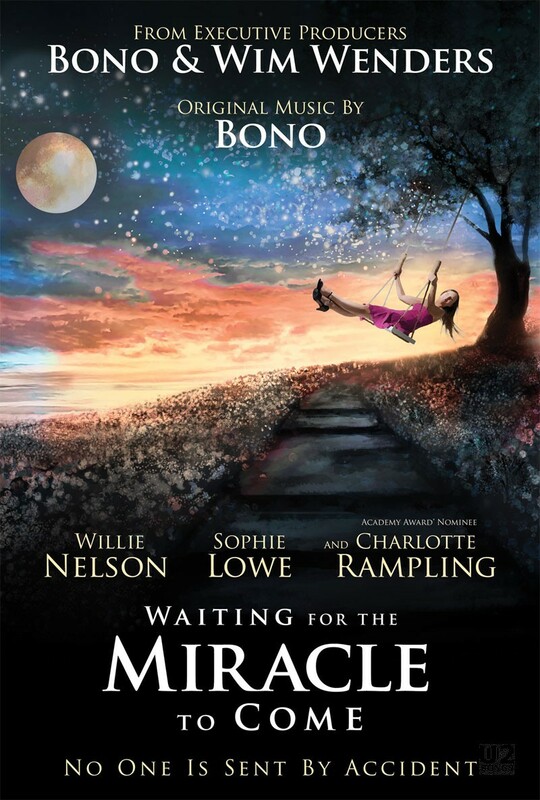 A new song co-written by Bono, “Where the Shadows Fall,” is featured in the feature film Waiting for the Miracle to Come which premiered at the Austin Film Festival this week. The song, co-written by Bono and long-time collaborator Simon Carmody, features in the film, and is sung by Willie Nelson for the film. Bono also performs on the track singing backing vocals in the chorus of the song. Many years ago I took Bono to see Wings of Desire, and he became a big Wim Wenders fan. Then Bono eventually introduced me to Wim Wenders, and Wim has been involved in all of my projects, really. My first stab at directing, he was in the edit room, and for pretty much everything I have ever done. He really helped me get this film made. It was imperative. I mean, I don’t think I would have gotten this film made at all without him. Given the subject and the cast. People don’t think of Willie so much as an actor these days. It was really Wim’s support as well as Bono that really helped me get it made. The song by Bono is the only song featuring any member of U2 in the film. Other music in the film is composed by Richard Souther, and the film also features a song by Nick Cave and the Bad Seeds, and one song performed by actress Charlotte Rampling. The song, “Where the Shadows Fall” was co-written by Bono and Simon Carmody. Carmody is a long time collaborator with Bono. He has co-written a number of songs for other artists to sing, including the song “Streets of Surrender (S.O.S. )“ recorded by Zucchero, “I Am the Blues“ recorded by Johnny Hallyday, “Sugar Daddy“ recorded by Tom Jones, and “Drinkin’ in the Day“ recorded by Ronnie Drew. Carmody is a long-time friend of Bono’s and a former member of the Irish band Golden Horde, who were signed to U2’s label Mother Records. The song has main vocals by Willie Nelson. Bono is listed as backing vocals in the credits for the track and can be heard singing in the chorus of the song. Guitar is provided on the song by another long standing member of the U2 recording team, Declan Gaffney. Gaffney has been working with U2 as a recording engineer on projects including No Line on the Horizon, including many of their recordings since that album. Harmonica on the track is provided by long time Willie Nelson collaborator, Mickey Raphael, who also performed on “Slow Dancing”. The song was recorded using Barlow’s mobile recording studio, and mixed at The Lookout Studio. Mastering was done by Scott Sedillo at Bernie Grundman Studios. Spotlight Pictures from Los Angeles have been working on international sales for the film but there has been little news to date about a wider release of the film. Production on the film started in March 2015, and Bono’s involvement was announced at that time. The premiere at the Austin Film Festival is the only known showings for the film at this time. At this time there is no word of a soundtrack release for the film. Thank you to Ronda for reporting information from the film screening for us.